Posted October 7th, 2013 by Yvonne Hawkey & filed under Events. 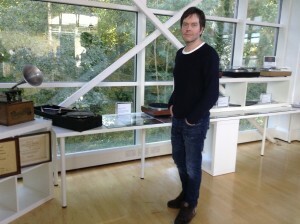 While it was fascinating to look around the factory display of Linn’s incredible history (see the photo of me admiring various LP12’s) the most impressive element of the event was the unveiling of the companies latest development – Exakt. Finally, a digital crossover system with drive unit optimisation and room correction that works musically ! I’ve come across numerous similar systems in ‘pro-audio’ that attempt to do this but ultimately fail to deliver on the promise, not so with Exakt. This new technology is so good that it even made the glorious analogue sound of the latest LP12 turntable more musically compelling – a stunning achievement to begin the next 40 years with.